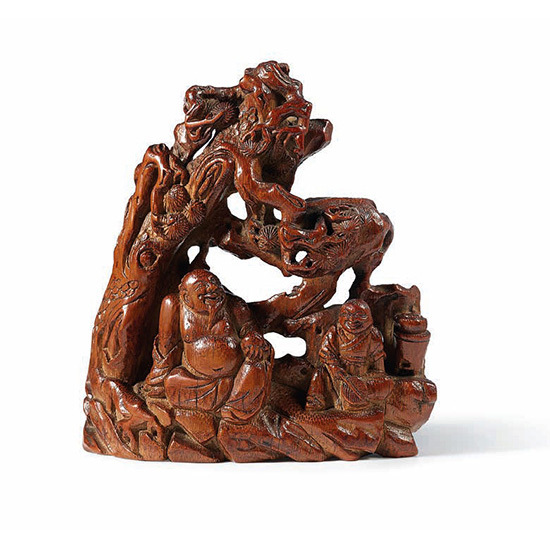 The large bamboo root is pierced and carved in high relief of a scholar with loose robes exposing a protruding belly and seated at ease with a hand resting on his raised knee next to an attendant brewing tea, all set in a rockwork alcove beneath a slanted gnarled pine tree. The bamboo root is patinated to a deep caramel colour. The subject matter alludes to the poet Tao Yuanming 陶淵明, known as Tao Qian 陶潛 (372-427), who was one of the greatest poets of the Six Dynasties. He abandoned his government position to live a secluded Daoist life in the mountains in pursuit of self-cultivation. A cylindrical brushpot with a similar design is published in Bamboo Carving of China, 1983, p. 123, Catalogue No. 66.